I recently had the honor of working with fabric designer, Franchelle Contreras . 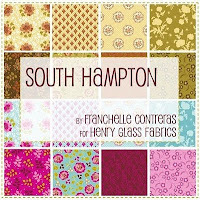 Her new line, South Hampton, for Henry Glass is a mix of bold bright beautiful colors and timeless prints...just beautiful. I designed a few pieces with the fabrics and asked my amazing photographer, Amy Tripple ,to shoot some photos of the designs. I could not be happier with the results...everything turned out so beautifully. Thank you both, Franchelle & Amy!!! Franchelle's new line, Sonoma, is due out this spring - I can't wait!!! Hi Maggie, I'm so happy you started a web blog, it looks great. The toddler dresses are adorable. Thank you so much for using the South Hampton Fabric collection. I look forward to working with you.